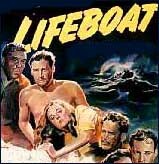 Composer David Raksin says that Alfred Hitchcock wanted no music for the 1944 film Lifeboat, because the characters are ''out on the open ocean. Where would the music come from?'' Raksin replied, ''Go back and ask him where the camera comes from and I'll tell him where the music comes from!'' (Kalinak xiii). successful music like the Jaws and Psycho themes allows them to be parodied. James Homer's soundtrack for Aliens makes musical allusions to Capricorn One and Star Wars (Karlin 151), and it is parodied, in its turn, by Evil Dead III: Army of Darkness. In comedy films, composers can also use contrapuntal music that plays directly against the textual theme. When Stanley Kubrick introduces the song ''Try a Little Tenderness'' to accompany two planes refueling in midair at the beginning of Dr. Strangelove, he makes a joke that contrasts with the dark and deadly implications of the rest of the film (Bazelon 112). Synthesizers are almost always used in SF and horror films because they can produce otherworldly sounds. But for straightforward emotion, horns are used too. These are associated with pageantry, the military, and the hunt, so they are used to suggest heroism. Movies featuring death-defying heroes such as Star Wars and RoboCop use a lot of horns (Kalinak 13). Such triumphant music implies certain guarantees, however. Carpenter says that for his version of The Thing, he insisted on grim music: ''If we had made the audience feel that we were in a heroic situation, that movie would be a cheat. ... When they hear that heroic sound they go, Oh, okay, everything's going to be all right. But it's not going to be all right ...!'' (Droney 118). high-pitched music to build fear. 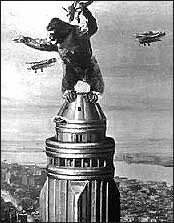 In Jerry Goldsmith's score for Planet of the Apes, after the three astronauts see the bizarre scarecrows up on the scaffolds, ''Goldsmith introduces high, exotic percussion sounds -- metal twangs produced by stainless-steel mixing bowls'' (Bazelon 86 -- 87). Again in that movie, when the female astronaut is discovered in a state of advanced decomposition, the strings seem to scream (Darby and Du Bois 518). 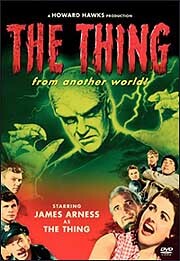 The 1951 version of The Thing features brass and high strings (Darby and Du Bois 252), though horns play along with the howling winds when the alien saucer is discovered in the ice -- this version was heroic. High strings seem ideal to express stress and tautly stretched nerves (like in The Omen). Or, they can evoke weird psychic goings-on (like in Poltergeist or for the theme to The X-Files) (Daiby and Du Bois 518). The sound mixers for the Michael Crichton movie Congo found that even high organic noises can build suspense. In the jungle, the birds and insects create a high ambient whine that pretty quickly gets on your nerves. As one of the mixers said, ''when they want to create a real feeling of anxiety, these insects are going to be played loud'' (Kenny, ''Sound for Three'' 83 -- 84). The violin in Psycho is so effective because it is used as percussion (Daiby and Du Bois 363), suggesting the knifestrokes. Deep sounds also sound percussive, and in fact you can feel them literally penetrating your body if the volume is strong enough. Jaws uses a sinister but very simple double bass which begins in long, heavy notes gradually acquiring a much faster attack (Darby and Du Bois 534). Another example of low music for suspense occurs in the opening of the Malcolm McDowell vehicle Time After Time. A prostitute stumbles past a London pub. We hear garish popular Victorian music from within. Then this switches to a deep, ominous double bass as the prostitute looks up and sees ... Jack the Ripper. But she thinks she sees just a well-dressed gentleman, so the soundtrack cleverly switches back to the pub music. The music is sinister just long enough for the audience to register the threat, but it doesn't insult us by playing on and on during the murder of the prostitute (Daiby and Du Bois 318). In the Star Wars movies, the appearance of the villains onscreen is likewise accompanied by deep or military sounds (Darby and Du Bois 537). What most audience members don't notice is that most protagonists also have their own theme music. The main Star Wars theme, written by John Williams, plays whenever Luke Skywalker and Princess Leia face important decisions, and when Obi Wan Kenobi dies. played whenever they were on screen (Whitfield 375). Mr. Spock's theme, for example, is played by ''an instrument that couldn't possibly be romantic, a bass guitar, down in the low register, with no resonance. It just klunks out the theme'' (Karlin 20). Star Trek Classic also played with the voices of alien characters. They would electronically raise or lower the voices of these actors to create an inhuman effect. A dangerous cat woman in Star Trek V: The Final Frontier has a voice made of real cat noises mixed with distorted James Brown screams (Spomitz 44). To make ''alien'' languages sound real, they are sometimes made from spliced-together bits of exotic Earth languages, such as Gikuyu and Nepali. This causes much hilarity when the movies play in countries where these languages are spoken (Berger 130). For this reason, the effects on Generations are surprisingly organic. Editors used natural sounds -- birdsong, human voices, wind noises -- all processed and mixed into the backgrounds, which is critical on Star Trek, since so much of the action takes place on the same ship, and if the backgrounds aren't diverse enough, it will sound too homogenous and claustrophobic. Of course, sick bay sounds different from the bridge, which sounds different from the more intimate confines of Whoopi Goldberg's quarters or Captain Picard's stateroom (Kenny, ''Star Trek Generations'' 80). The noise of the Klingon bird-of-prey spaceship contains the songs of whales, ironically enough. The mysterious Nexus energy wave which appears at the climax of Generations combined more than 30 elements, including animal cries to give it a subliminal sense of a living, deadly creature (Kenny, ''Star Trek Generations'' 78). When the Klingons destroy the Voyager probe in Star Trek V, the explosion contains the sounds of a woman's scream and the cartoon character the Tasmanian Devil (Spotnitz 44). Another unexpected organic quality can be found in The Empire Strikes Back, in which a large door was given no mechanical-sound basis but does have a lion's growl buried subliminally in it (Berger 130). There are plenty of other surprises to be found in the sound studio, where a sound effect is very often not what you think. More information that Trekkers might like to know about their favorite show is that the transporter's Beaming down sound is made by piano wires strung across a literal beam (Kenny, ''Star Trek Generations'' 76). When you see the sliding doors opening and closing, what you hear is a bunch of different sounds including an air gun reversed and somebody's sneakers squeaking on the floor to give it the rubber-seal effect (Kenny, ''Star Trek Generations'' 76). The photon torpedo blasts don't sound like what they really are -- the recording of a Slinky (Spotnitz 44). Raiders of the Lost Ark opens with Indiana Jones fleeing a runaway boulder. That noise was actually the sound editor's Honda Civic rolling down his driveway (Spotnitz 42). The light sabers in Star Wars are the sounds of a TV picture tube and an old 35mm projector (Spotnitz 44). Luke Skywalker's land cruiser is the noise of the Los Angeles Harbor freeway traffic heard through a vacuumcleaner pipe (Spotnitz 44). Star Wars goes for gritty sounds, which is why those movies sound like our world and Star Trek sounds like a better one (Spotnitz 44). The crew on Congo found that the gorilla's natural cries weren't scary enough -- gorillas actually make a soft, hooting noise, whereas the director wanted a booming, Jurassic Park effect. So the post-production men recorded the sound of howler monkeys, which do have a low, throaty growl (Kenny, ''Sound for Three'' 83 -- 84). Does that seem deflating? At least the sounds were made by wild animals. The sound designer for Jumanji had to come up with vocalizations for unusually intelligent and mischievous monkeys from a wild, exotic, paradimensional world. What did he use? His eight-year-old son (Kenny, ''Monkey Business'' 113). Another interesting monster sound was achieved in the made-for-TV movie based on Stephen King's The Langoliers. The langoliers are nearly all mouth, so they needed to have a predatory effect. But King had described the sound of their approach as being reminiscent of Rice Krispies. Although the langoliers, who literally eat the world, would realistically require combinations of grinding, screeching, scraping and the crunching of metal, pavement, and earth, the executive producer was adamant that they should not sound mechanical. Sound editor Ray Palagy says, ''We actually spent an entire day recording cereal sounds -- dry cereal, wet, mushy; in a bowl, in a tub ...'' They took all of these sounds and made processed versions of all of them. Then they added effects such as Velcro, car doors, subway screeches and lion growls to yield ''signature'' sounds that are hard to categorize as animal or machine. Because supernatural creatures such as the Langoliers are based on no equivalent in the real world, they have to sound unique (Eskow 164). pistachio being crunched by a metal plate (Kenny, ''T2'' 60 -- 61). The sound crew of Generations must have been amused when told that they were going to have to create the sound of the Enterprise crashing into a planet, destroying hundreds of feet of terrain, and yet not totally self-destructing in the process. What is the sound of a starship hitting a planet? The basic noise is a recording of ''dry ice on bare metal, which gives this annoying moaning, groaning, wrenching, metallic sound.'' Then they added noises like earthquake rumbles, cars skidding through gravel, tree cracks, and explosions. ''The idea is to introduce variety to sustain interest'' in the audience, who subconsciously expect a variety of sounds to match the changing picture on screen (Kenny, ''Star Trek Generations'' 78). cars, which look like they are exploding, because they weren't exploding. They were just being demolished to the point where they would collapse. It was tricky to just use hits on metal, and glass [breaking] ... and ricochets that sounded like thuds'' (Kenny, ''T2'' 64). Another major problem is trying to get a clean recording of dialogue when your background is noisy. The production sound mixers for Congo found that ''Few shooting locations on the planet can be more challenging ... than a tropical rain forest. It's wet, even in the dry season. It's hot. And the insects are big and loud, making it difficult to pull clean dialog tracks out of the backgrounds.'' Mixer Ron Judkins, who won an Academy Award for Jurassic Park, described it as ''the most strenuous working situation I've ever been in.'' And one location was right on the edge of an extinct, but still hissing volcano crater (Kenny, ''Sound for Three,'' 76). So next time when you go to the movies, give the sound effects a round of applause. Rydstrom, sound designer for Terminator 2, says, ''Your first thought when you see a lot of special effects is that sound's job is to not only do something as fantastical as the visual, but also to make it real. It's not competing with the special visual effect, because people perceive the visual and the sound differently. [Sound designer] Walter Murch had a way of putting it: The eyes are the front door, and the ears are the back door'' (Kenny, ''T2'' 61). Darby, William and Jack Du Bois. American Film Music: Major Composers. Techniques, Trends, 1915 -- 1990. Jefferson, NC: McFarland & Co., 1990. Kalinak, Kathryn. Settling the Score: Music and the Classical Hollywood Film. Madison: U of Wisconsin P, 1992. Karlin, Fred. Listening to Movies: The Film Lover's Guide to Film Music. New York: Schirmer, 1994. Whitfield, Stephen E. and Gene Roddenberry. The Making of Star Trek. New York: Ballantine Books, 1968. Sound Effects in SF and Horror Films," in Kongressbok ConFuse 96, the program booklet for the SF convention held in Linköping, Sweden, June 14 -16, 1996, p. 44-50.